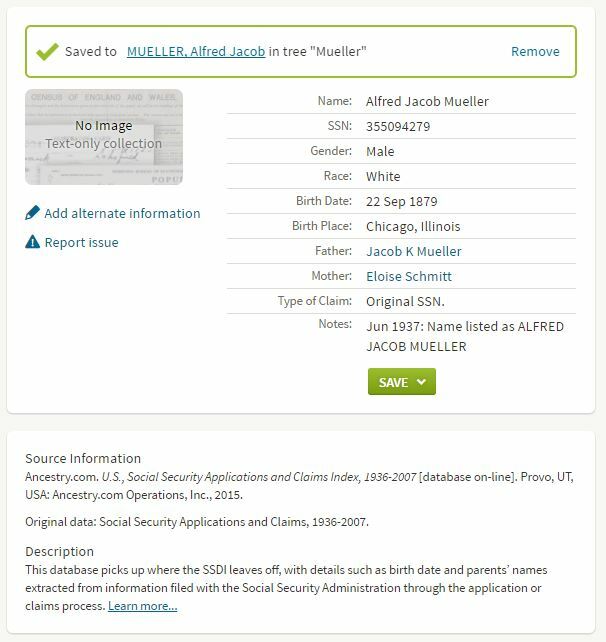 While trying to prove my great-grandfather had indeed been born, I realized I didn’t have all of the documents identified as sources or alternative sources on Ancestry for Alfred MUELLER’s date of birth. One of those documents listed Alfred’s exact date of birth, the very thing I was trying to prove. According to Ancestry, the Social Security Applications and Claims Index “picks up where the SSDI leaves off with such details as birth date and parents’ names extracted from information filed with the Social Security Administration through the application or claims processes”. In the case of my great-grandfather, the form known as the SS-5 was his original application for a Social Security number. 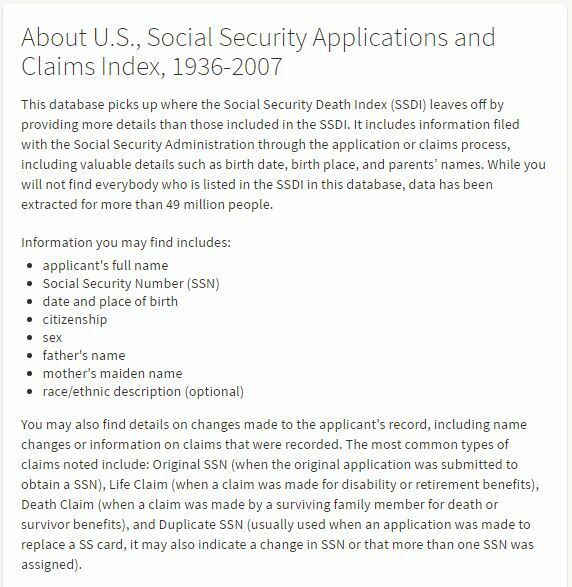 Alfred’s SS-5 was more valuable to me than the SSDI (Social Security Death Index) in the quest to prove his date of birth because it had been completed by the subject of my search. After reading the Source Information under the results of my online search (image above on the right), I read the description of the database and opted to ‘learn more’ by clicking on the link. I was surprised to read that more than 49 million people are included in this database. The three most common types of claims are the original Social Security number application, a life claim, and a duplicate Social Security Number application. Of the three, the original application seemed the one most likely to provide the information I needed. With a link! Which I clicked! The form that appeared was very easy to complete; all the information I needed had been provided for me in the index. I spelled each name exactly as the index did to ensure there would be no question of the match. Since Alfred’s Social Security number was included in the index, the photocopy fee was $27. 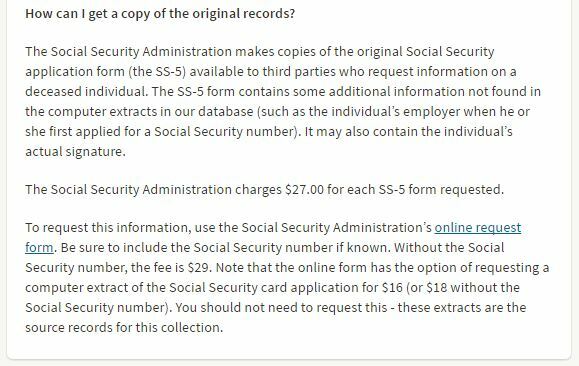 Without a Social Security number, the fee is $29. 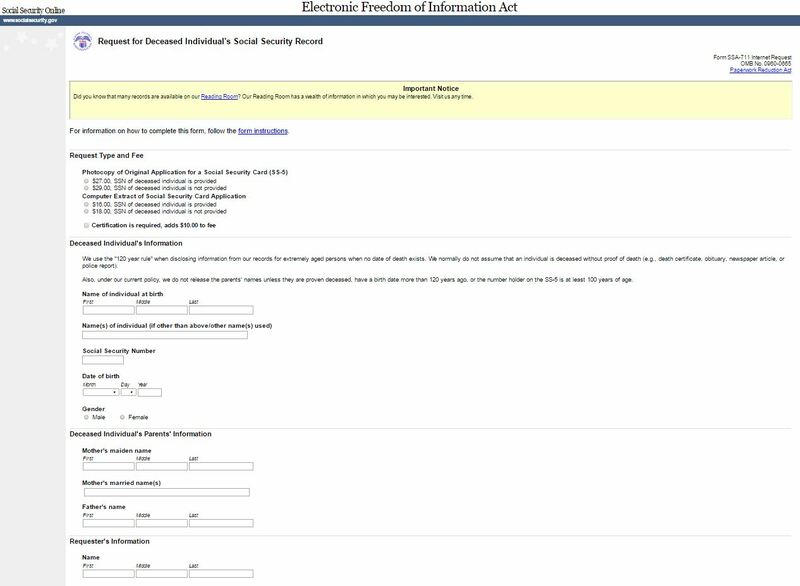 I completed the Requestor’s Information section with my name and mailing address. At the next screen I added a credit card number and the process was complete. The only thing left to do was wait. But I didn’t have to wait long! I placed my order Monday September 5th and Alfred’s SS-5 form was in my mailbox Friday September 16th. Was the form worth $27.00? Absolutely! I’ll share the wonderful details in a future post. 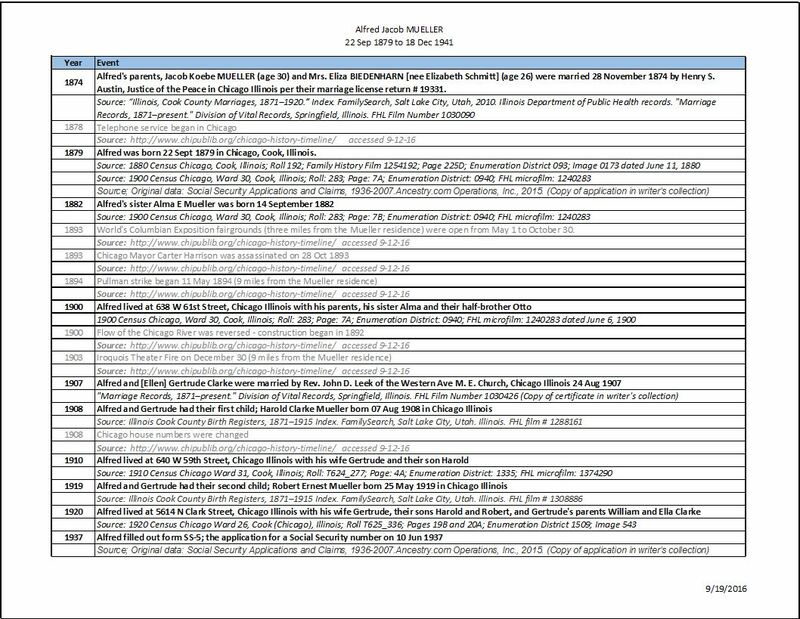 Of course this project is still very much a work in progress, but it’s been one of the most enlightening of all my genealogical searches. And I’ve been at this for a long time. The SSCAI is one of my favorite databases these days! And I have also had good luck with SS5s, though I’ve had to wait much longer than you did. I look forward to the next post to see what you learned. Thanks Amy – the SS-5 confirmed a tidbit in my tree. Can’t wait to share!